38 | TH E M R EP O RT O R I G I NAT I O N S E R V I C I N G DATA G O V E R N M E N T S E C O N DA R Y M A R K E T ORIGINATION First-time Buyers Find Homeownership Affordable A survey shows many millennial first-time buyers are purchasing "steppingstone" and fixer-upper homes. W hen first-time homebuyers make the jump from renting to homeowning, they have to ask "Is it affordable?" According to the Bank of America Homebuyer In - sights Report, the answer, for the most part, is yes. Many first-time homebuyers, particularly millen- nials, have found that owning a home has a more positive impact on their finances than renting. According to the report, 86 percent of millennial homeown - ers find homeowning to be more affordable, and 79 percent of millennials believe homeowning will have a positive impact on their long-term financial picture. Overall, 72 percent of homeown - ers across all age groups feel the same way. "Clearly, the millennial genera- tion is coming of age and realizing it might not make sense to wait anymore to purchase their first home," said D. Steve Boland, Bank of America's Consumer Lending Executive. "While 'dreamers' told us last year that they want to skip the starter home in favor of a house that suits their needs over the long term, the overwhelming majority of millennial homeowners say their current home is a 'step - pingstone' to their forever home." Within the next two years, one in four prospective buyers plan on buying a new home. Many of these buyers have already begun planning for a down payment. Bank of America reported that 35 percent of all first-time buyers have begun planning. Almost half of the surveyed first-time buyers believe they would qualify for a down payment assistance program. Finances are the biggest factor considered when first-time home - buyers are looking into buying a home. Over half of prospective buyers, or 52 percent, mark having the financial means to purchase as the trigger to buying a new home. The thriftiness of first-time millennial homebuyers is reflected in the homes they're choosing as well. Many of these new home - buyers prefer fixer-uppers over move-in ready homes. Only 41 percent of millennials would buy a move-in ready home, compared to 55 percent of Gen Xers and 66 percent of Baby Boomers. Additionally, first-time buyers are more likely to perform home improvements themselves, rather than pay someone to do them. Though they may not all be buying fixer-uppers, 70 percent of homeowners report that they spend a lot of their free time working on their home, and 82 percent report that they look for ways to increase the value of their home. However, value goes beyond money, as nearly every respondent stated that they are proud of own - ing their home and treasure the memories made within it. 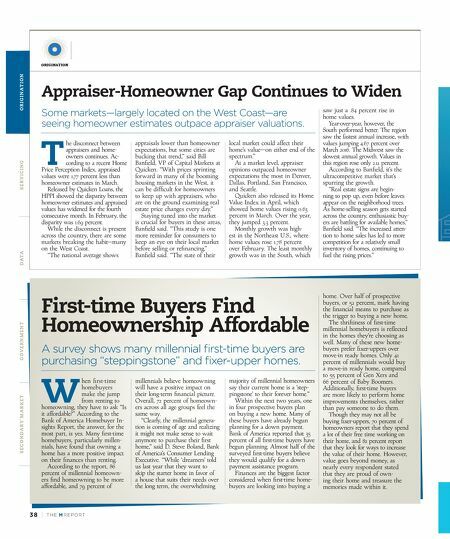 Appraiser-Homeowner Gap Continues to Widen Some markets—largely located on the West Coast—are seeing homeowner estimates outpace appraiser valuations. T he disconnect between appraisers and home- owners continues. Ac- cording to a recent Home Price Perception Index, appraised values were 1.77 percent less than homeowner estimates in March. Released by Quicken Loans, the HPPI showed the disparity between homeowner estimates and appraised values has widened for the fourth consecutive month. In February, the disparity was 1.69 percent. While the disconnect is present across the country, there are some markets breaking the habit—many on the West Coast. "The national average shows appraisals lower than homeowner expectations, but some cities are bucking that trend," said Bill Banfield, VP of Capital Markets at Quicken. 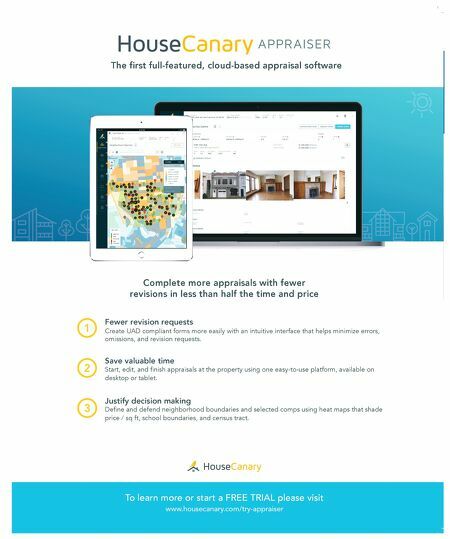 "With prices sprinting forward in many of the booming housing markets in the West, it can be difficult for homeowners to keep up with appraisers, who are on the ground examining real estate price changes every day." Staying tuned into the market is crucial for buyers in these areas, Banfield said. "This study is one more reminder for consumers to keep an eye on their local market before selling or refinancing," Banfield said. "The state of their local market could affect their home's value—on either end of the spectrum." At a market level, appraiser opinions outpaced homeowner expectations the most in Denver, Dallas, Portland, San Francisco, and Seattle. Quicken also released its Home Value Index in April, which showed home values rising 0.63 percent in March. Over the year, they jumped 3.3 percent. Monthly growth was high - est in the Northeast U.S., where home values rose 1.78 percent over February. The least monthly growth was in the South, which saw just a .84 percent rise in home values. Year-over-year, however, the South performed better. The region saw the fastest annual increase, with values jumping 4.67 percent over March 2016. The Midwest saw the slowest annual growth. Values in this region rose only 2.11 percent. According to Banfield, it's the ultracompetitive market that's spurring the growth. "Real estate signs are begin - ning to pop up, even before leaves appear on the neighborhood trees. As home-selling season gets started across the country, enthusiastic buy - ers are battling for available homes," Banfield said. "The increased atten- tion to home sales has led to more competition for a relatively small inventory of homes, continuing to fuel the rising prices."